40 years ago today (September 25), The Partridge Family premiered on ABC-TV at 8:30 PM! I thought it would be fun to have a thread where we can all share our thoughts, recollections, etc. Let's make this a fun thread! Well, I shall look forward to reading everyone's recollections. Wow, 40 years, I cant believe it! I so wish they would bring out a special 40th edition box set, in region 2, I'm so disappointed (given up on the unreleased tracks). Only seasons 1 and 2 are available in Region 2 (UK) and I'd love to get copies of 3 and 4. I've shown my kids clips (they're young adults now a boy and a girl). They love the retro feel of the show, they laughed at David's hair, well his early season 1 hair was ok according to them, (sorry David!) but liked all the characters overall and thought the show amusing. They reckon you could take Susan Dey out of the seventies and she wouldn't look out of place today. My daughter loved her clothes and dress style, in fact she resembles Susan a bit. Looking back, I like the first season where they were 'on the road' the most. A HAPPY QUADRAGENNIAL TO THE PARTRIDGE FAMILY!! Come On Get Happy! 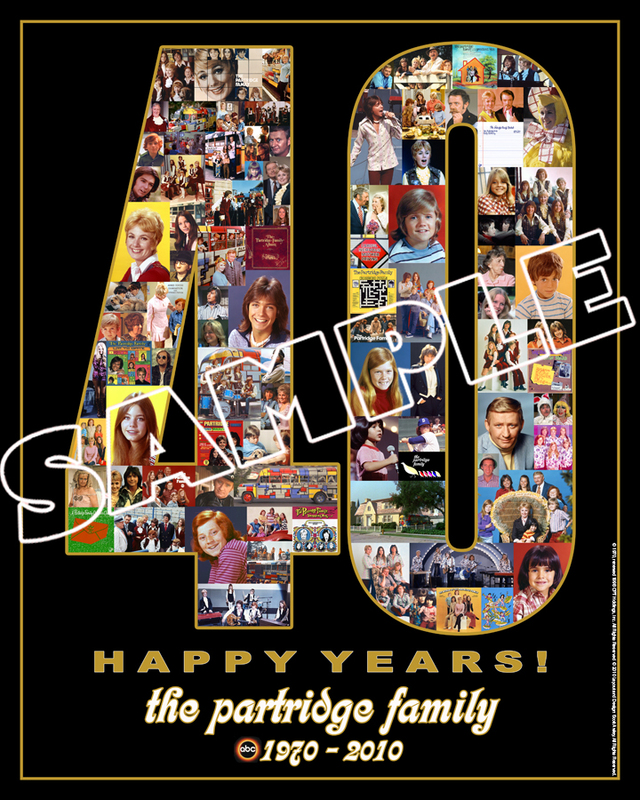 It's the Partridge Family's 40th Anniversary! (Sept. 24) -- It was 40 years ago today, Shirley Partridge taught the band to play. OK, so maybe it was Keith. 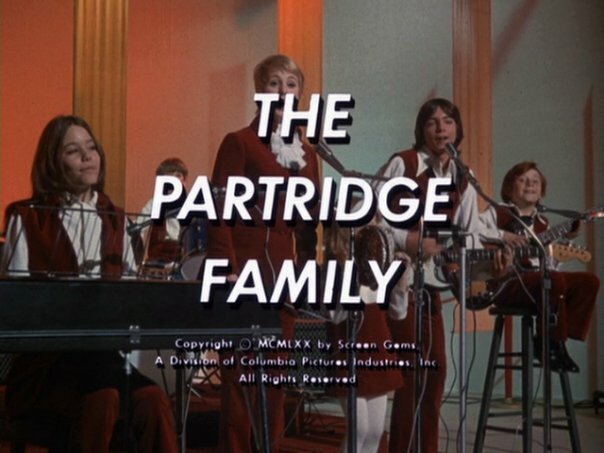 Either way, "The Partridge Family," a landmark show about a fictional singing group that produced a very real teen idol who, in turn, helped sell the records the group performed on the show, is 40 years old. It premiered back on Sept. 25, 1970, quickly turning David Cassidy, now 60, into a teenybopper sensation. Today, the concept of singing stars living outside their TV shows as separate characters (see Miley Cyrus and the Jonas Brothers) seems obvious. But in 1970 it was still an extremely creative way to market music to the younger set. A few years earlier, "The Monkees" had created a template for the formula, but "The Partridge Family" took it to all new heights. Inspired by the real-life singing family group The Cowsills, producers originally thought about using the Cowsill kids in the show but opted for actors instead. And so, on Sept. 25, 1970, the world was formally introduced to Cassidy (Keith), Susan Dey (Laurie), Danny Bonaduce (Danny), Suzanne Crough (Tracy) and Jeremy Gelbwaks (Chris). Shirley Jones, who played the mother of the five musically talented children and nervously drove the psychedelic bus, of course, was already a star on Broadway and in film. Dave Madden, who played the band's hapless manager, Reuben Kincaid, had recently been starring on the comedy TV show "Laugh-In." The show broke new ground in several ways. First, the concept of a single mom raising a litter of kids was still a relatively new idea for television. Then, there was the novel premise of a mom raising kids on the road, as a touring band, aboard that iconic, Mondrian-inspired school bus. And of course, unlike other shows on TV at that point, "The Partridge Family" was a built-in hit machine fueled by the good looks and bubble gum charm of Cassidy. The "group's" first No. 1 hit single, "I Think I Love You," was released to coincide with the debut of the show. Only Cassidy and Jones sang on the song and were backed by several famed studio musicians including Hal Blaine and Louis Shelton. Throughout the show's four-year run, many songs from the series owned the charts, and with good reason: The producers hired top-shelf songwriters, including Rupert Holmes ("Echo Valley 26809"), Wes Farrell and Gerry Goffin ("I'll Meet You Halfway") and Tony Romeo ("I Think I Love You," "It's One of Those Nights"). Then there were Tommy Boyce and Bobby Hart, Carole King, Barry Mann and Cynthia Well -- the list of pedigreed songwriters who added to the show goes on. Today, the entire cast is still alive and well and, with the exception of Dey, had no problem taking the time to speak with AOL News about their memories of the show. Dey, as has been widely covered, has never taken part in any "Partridge Family" extracurricular activities like talk-show panel reunions or autograph shows. Historically, she has refused to talk about the show, and since starring in "L.A. Law" for six years (ending in 1992), she has maintained a low-profile, if not invisible, existence. "I don't get it," Bonaduce, today a popular morning man on WYSP radio in Philadelphia, told AOL News. "She had the best post-Partridge acting career of us all. It isn't like it hurt her or anything. Come on, Susan!" Bonaduce, whose high-profile run-ins with the law, reality TV show and various celebrity boxing events kept him firmly in the public eye over the years, relishes his history as bassist Danny Partridge. "I owe my life to that show," he said. "It wasn't like I was much of an actor. I was just sort of playing myself, a precocious, wisecracking kid. So I'm glad people still remember it fondly. And I got to hang out with David Cassidy!" Today, Cassidy, whose poster image was pinned up in thousands of teenage girls' bedrooms in the 1970s, tours in concert in America and worldwide -- and will return as a guest on Oprah's last season, taping Oct. 22. He told AOL News that he never imagined the show would have the impact it continues to have. "When you're 19 years old and you're making a living as an actor and musician, you can't imagine the kind of success internationally, universally that we received. "There was no video, there were no CD's or DVD's, so people sat in their living rooms watching the show every Friday night -- as a family -- and there was a much more immediate response. It catapulted me to having the largest fan club at that time in history, and the merchandising, which still continues, was unprecedented both financially and in terms of volume." Cassidy also learned a hard lesson in how teen idols were bought, sold and traded back then. "Although I was young at the time, I recognized how we made a mark on the entertainment and licensing industries. Actors, however, were not being compensated for any ancillary income, and we were being paid very little at the time. "Because I was a minor legally when I first signed the contract, my manager and I were able to re-negotiate and, in doing so, I was able to set a precedent by being the first person to contractually receive royalties on merchandising and net profit sharing, which laid the foundation for everyone since. "Of course, most of us share the same problem trying to collect the money due us. It's fascinating because I've just done an audit of Sony Entertainment for the last three years only and it showed I am owed millions of dollars for television and merchandising alone. Imagine what I'm due for the last 30 years! Now the fight begins to try to collect it." The younger Partridges, Chris and Tracy, who rarely spoke on the show, are downright chatty about it 40 years later. Gelbwaks, the original Chris Partridge, today is a management consultant in New Jersey. "The show was incrementally groundbreaking," he told AOL News. "To have that sort of rock and roll lifestyle, tame as it was, was a big idea. My best memories are working with some of the legendary actors they brought in, like Ray Bolger, who played the Scarecrow in 'The Wizard of Oz.' And of course, the drum lessons to make me look like I knew what I was doing were fun." Gelbwaks remembers leaving the show after the first season, but when he entered his new school, the show was just going on the air, making him an instant pint-sized celebrity among his new classmates. Forster, who replaced Gelbwaks as Chris for the final three seasons, also remembers the musical lessons. "Anything they could do to make us seem sort of authentic," he said with a laugh. Today, the racing car enthusiast and entrepreneur (and great-great-great-grandson of author Charles Dickens) says he hasn't seen the show for years but still enjoys taking part in the occasional get-together. As does Crough, the triangle- and tambourine-playing youngest daughter, Tracy. Today, she lives outside Las Vegas with her family and stays in touch with several cast members. "It's easy today with e-mail, and that's a fun era to talk about. Mostly I remember Fridays because it was 'music day' when we'd tape the song of the week. That meant the heavy velvet costumes and more 'percussion' lessons for me." Shirley Jones, who still performs, told AOL News she thinks the show will be best remembered "For presenting American TV with one of its first 'working mothers' and for producing a few teen idols. I think the pilot still stands out as the best episode of all and overall, I have nothing but warm memories of doing the show." The affable Madden, who portrayed the band's manager, thinks the show did itself a disservice after the first season. "Here you had this great concept," he told AOL News. "A family that traveled, performed, did exciting things -- and it was a hit! So what happens? Network execs get scared by success. Season two, they say the family has to stay home more. The kids have to go to school. It became more like a traditional sitcom. They started over-thinking it and took away the things that made it special. They made it too squeaky clean. One episode I said, 'Gee Danny, that's rotten.' Then they decided 'rotten' was too strong a word so they changed it to 'awful.' Think times have changed today?" Madden also remembers being incredulous when the show was moved from Friday to Saturday night. "They had this great thing going. 'The Brady Bunch,' 'The Partridge Family,' 'The Odd Couple.' They owned the night. Then they moved us against 'All in the Family' on Saturdays, which killed us." By the fourth season, in the face of shrinking ratings, the producers pulled out some typical stops, like bringing in a new cute kid named Ricky Segall ('The Brady Bunch' tried a similar move with Cousin Oliver) but to no avail. On Aug. 31, 1974, the curtain came down on "The Partridge Family." All of the cast members interviewed told AOL News that they'd be up for an episodic TV reunion should the opportunity arise, with a few caveats. Cassidy said, "I would love to do something satirical that could be self-deprecating and humorous at the same time, but given the time in which we shot the show, and the climate of the world today, it would be hard to imagine replicating what we did then." Madden thinks it would be "preposterous" and "impossible" but, if it happened, he'd entertain the idea. All that would leave is Dey. Madden says he's in almost daily contact with the reclusive actress, either by phone or e-mail (though out of respect for their friendship, he'll reveal no details except to say she's on the coast living with her family). So, to any enterprising producers reading this, should you want to try to make a "Partridge Family" reunion happen, take note that you'll obviously need to go through their longtime manager, Reuben Kincaid. Thanks for that Scott. What I found interesting in that was the audit David performed with Sony...wonder if he'll ever see that money. Maybe if Sony forks over David will reconsider the unreleased stuff. I watched the pilot last night and now gotta continue with the entire series. Love the pic of the 40th Anniversary poster so I had to go online and order one, can't wait to get it. Thanks for posting a pic of it Scott! Where can you get that poster???? I would love to get one as a gift and one for myself!!!! Wish I had some TV time available on Saturday. But I did wear my c'mon get happy shirt and played PF CD's al day while running places in the car. Did get somet interesting comments when folks commented on my shirt and I reminded them that it was 40 years. Most folks do seem to remember fondly though, estp. David Cassidy. Soctt, where can i get that poster, It's really neat. The poster is something I designed a few months ago. At the time, there was a chance of getting a 40th reunion-type gathering at a local autograph show in Burbank, CA -- the same one that Shirley, Brian, Suzanne and Ricky have attended in the past. But, schedules prevented that from happening for the upcoming show. So, I have the samples left over that I had printed and I am trying to get some monies back. I put a few of them on eBay. It's all in chronological order, contains all of the cast, LPs, memorable guest stars, and even the cartoon. I had fun working on it and was hoping to have them available for the cast to sign for fans that attended the show-that-isn't-happening. Oh well. I remember putting the book jacket from Up To Date on my math book -- and taking it off almost immediately because by that time, the PF was so NOT cool if you were a guy. So off came the book jacket and on went a generic paper grocery store bag. Ha, Scott, I did the same thing with my tape recorder! Pressing the microphone into the speaker of the TV set to get the best possible sound. Have to say, though, I didn't listen through my pillow. But I still have some of those cassettes. Monday nights were always very exciting here in Canada. I remember watching the chicken episode at my friend Martin's house. I boarded the bus sometime early in the first season but I did not watch from the beginning. So I did not see the pilot until the show went into syndication, at 5 p.m. weekdays on CBC (at dinner time, so I watched on the little TV that sat on a shelf in the kitchen -- it was the dawn of the portable TV set and our family of 5 had 6 TVs). I clearly remember finally seeing the pilot and being breathless with excitement, thinking it was some amazing long-lost episode -- the house was backwards! The theme song was different! David Cassidy wasn't singing! Honestly, sometimes I still have dreams about coming across some never-before-seen episode or being in a used record store and finding an LP I never knew existed. I remember how it was must-see TV back in the day. We always had to hurry to get our Friday baths and hair washing done before it came on. Up to date was the first stereo album that us kids had in the house and it got played constantly. I remember also buying the 2 and 5th mystery novels through Scholastic book club and then picking up some of the others when shopping with my Aunt. Read the Tiger Beat magazines while my Mom did her grocery shopping. Wasn't allowed to buy much stuff as my parents weren't into collecting. Obviously, I have changed that. Scott: Love the poster! Speaking of T-shirts, how 'bout T-shirts with Scotts 40th art work on them? Sport our Partridge Pride! I recorded the songs with my cassette player too! Yep, placed the mike right up by the TV speaker! It was a fun and exciting time. I really loved the Partridge Family back then. It was so exciting to listen to each new album for the first time! My Mom got me Tiger Beat, Fave!, Tiger Beat Spectacular and best of all Tiger Beat's Official Partridge Family Magazine when she could find it at the grocery store. During the first season I had to wait until the reruns came on to watch the show because we had only one B&W TV set back then and my Mom's favorite show " Name of The Game" came on at the same time that The Partridge Family did. But we got another TV later and I could watch the show from the first episodes each season. I spent my money on getting the PF albums ( with my parents help!) so did not buy the trading cards. I did however get all 17 PF paperback novels! It was a fun time, one that would not be repeated.